How did this patient hear about The Encore: A friend who knew about The Encore told patients sister. simple directions such as being asked to blink and was only able to answer yes and no questions with a very minimal nod and headshake. Her speech therapist decided to try a different method. She brought in a cold moist spoon and did cold oral sensory stimulation (placed the spoon on Irene’s tongue). This initiated Irene’s first real response. Her swallow was delayed and weak, but this became the primary focus as it was something to expand on due to it being her strongest response. When asked if she wanted to do it again, Irene suddenly had a much stronger nod. As time moved along, the swallowing stayed more consistent although Irene had some difficulties staying awake and had trouble with single unit questions. About a week later, she began talking. She was answering two-unit questions which shortly progressed to multiple unit questions! Everything began progressing for the better very quickly which led to Irene and her family telling people how grateful they are for her therapists and her. Only a few days later, Irene was able to name objects in the environment, answer W.H. questions (who what when where), and count the days of the week and the months of the year. Her cold oral sensory stimulation also escalated to 100% on swallowing. This began a new journey… foods and liquids! At the end of the week, Irene was tolerating drops of water! The next week Irene’s therapist started testing minimal amounts of thin water and was successful! This led to trials of mechanical soft food which was a success, leading her to regular food and that was successful as well! Her swallowing was strong! Irene can eat regular foods again, completely opposite of the conditions she was in upon arriving at The Encore! Irene shared her whole story with the concierge director while enjoying a tuna fish sandwich that The Encore had served for lunch that day! We wish Irene many more years of health and hope she enjoys all the delicious foods out there that she now can continue to experience. Congratulations to our Professional of the Quarter, Dave Smith, Director of Environmental Services at The Encore at Boca Raton Rehabilitation and Nursing Center! Dave Smith has been working in healthcare for 46 years, 36 of those years at The Encore; Smith was brought on as the community was being built. Dave Smith is a finalist for the Professional of the Year contest; the winner will be announced during Nursing Home Week 2019! Congratulations Dave Smith! You are #TheCareRiteDifference! Mr. Paul Kachmarik arrived to The Encore at Boca Raton from West Boca Medical Center for a weak lower body and severity levels of unstable medical conditions. He was highly discouraged and was not sure if he was going to succeed. Paul was unable to get out of bed, was on max assist of two, and was unable to propel a wheelchair on his own. After being evaluated by his therapist, he immediately got to work. For the first few weeks, the therapists worked hard with him, but Paul was unable to do too much exercise due to a weak heart. Nonetheless, Paul remained motivated. He reached a level of moderate assist and walked 30 feet altogether! Paul’s progression really took off throughout the weeks. He progressed to contact guard assist, walked 100 feet, wheeled himself to therapy, was able to get out of bed, and dress his upper body all on his own! Within a week, he progressed to 200 feet standby assist, was able to walk to therapy, able to car transfer with a rolling walker, which very soon led to supervision! We are always proud of our residents, patients, and staff, but hearing the kind words from Paul was a pleasant reminder that we always strive for the best for everyone that walks through the doors at The Encore. We wish Paul the best of luck! How did this patient hear about The Encore: A former patient of the resident shared about The Encore with the residents’ son (as the resident was a chiropractor). Dr. Marshall Kaufer was admitted to The Encore at Boca Raton from Delray Medical Center for an urinary tract infection, muscle illness, and an enlarged aortic. He came on max assist, could not bathe, could not lower body dress, and could not get out of bed. Upon arrival, he was greeted by the concierge director as well as the admissions director to ensure his comfort while staying at The Encore. Dr. Kaufer was very discouraged when he arrived and was not at all motivated; he just wanted to go home. He shared with our of concierge, “I thought I was going to die. I was a mess, I couldn’t walk.” His therapists, Debra De Silva and Grace Montague arrived to evaluate him. During his first session, he walked 50 feet with a rolling walker and contact guard assist. Dr. Kaufer continued to work hard with his therapists. He began making much better and quicker progress. With only a few more weeks, Dr. Kaufers progress escalated to incredible levels . He had gotten to a point of getting out of bed, dressing, and going to the bathroom all on his own! Dr. Kaufer was discharged to his home on October 15th, 2018, walking 150 feet. He had came from max assist to independence with a walker! We wish Dr. Kaufer only health and happiness going forward! How did this patient hear about The Encore: Patient’s sister, internet search. Mr. John Giragos was admitted to The Encore from Delray Medical Center with a diagnosis of Quadriparesis (weakness in arms and legs). Upon arrival, he was greeted by the Assistant Administrator, the Director of Admissions, and the Director of Concierge Services to assure Mr. Giragos excellent customer service and comfort. Mr. Giragos was quite concerned as he had never needed skilled care and rehabilitation before. He shared, “I was afraid and uncertain,” with the team at The Encore. The next day, Mr. Giragos was evaluated by his therapists. He was extremely frustrated to be in this situation. He was determined to get back to running his restaurant (John G’s) in Manalapan. He was extremely motivated and determined to do what he had to do to get his health back! Mr. Giragos required minimal assistance for bed mobility and transfers, and he was only able to ambulate 60 feet with a walker. He also required max assist for dressing and showering. Despite having great determination and motivation, Mr. Giragos did experience periods of self-doubt and uneasiness during the early stages of his healing journey. Who wouldn’t in his situation? The team here at The Encore provided consistent support and guidance, reassuring him that the small victories would eventually make it all worthwhile! The therapists decided to work with Mr. Giragos in the ADL suite (an area simulated as a home with a kitchen, a bedroom, and a bathroom) to familiarize him with the environment of being back home. As a restaurant owner, the kitchen would be a sanctuary for him and an area that he would be spending a great deal of his time. His goal was to work on his fine motor skills and crafting through use of his hands. Within just a short time, Mr. Giragos was able to chop vegetables as he had prior to his hospitalization. His successes were a breakthrough as Mr. Giragos began to have greater amounts of hope and inspiration; he even made a signature turkey sandwich of his! 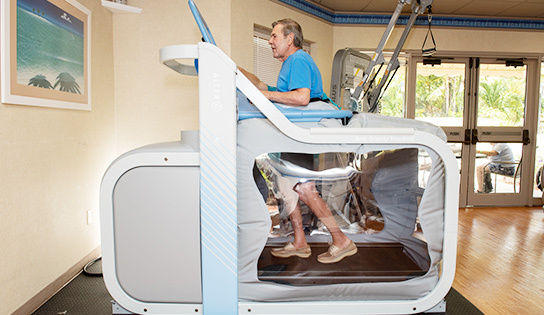 With the support of the litegait, he began to increase his walking distances and his mobility subsequently improved. We wish John the very best with only happiness and health! He shared with the Director of Concierge Services that he plans on stopping by soon to see everyone. We look forward to seeing him! Mr. Richard Melito was admitted to The Encore from the University of Miami Hospital for melanoma and a tear duct (skin cancer). He was barely able to function when arriving at the hospital. He was unable to roll over in bed and if he would sit up, he would get dizzy and have to lay down quickly to avoid passing out. After a few weeks of slow but steady progress, Mr. Melito was able to join the therapy team in the gym for a short time due to his ability to sit up longer. Mr. Melito would use the seated stepping machine and the standing frame but would have to end his sessions very early due to dizziness from his low blood pressure. Two weeks after that, Mr. Melito was walking 100 feet with a walker and minimal assist. His progress began improving vastly at this point and with a short time, this expanded to 150 feet with contact guard assist! Just two weeks after that, Mr. Melito was walking 200 feet with only standby assist! We wish Richard and Debbie only the best going forward and can’t wait to see him keep on progressing! Mr. Stephen Frazier arrived at The Encore after discharging from Bethesda Hospital where he had moderate to maximal assist for all of his activities of daily living (ADL’s). He was extremely weak, was in a lot of pain, and was NPO (unable to consume food or drink by mouth). It appeared from previous test results that Mr. Frazier would be unable to ever eat by mouth again. Mr. Frazier was extremely depressed about his condition. Aside from being extremely frustrated and anxious about his poor swallowing, he was also the caregiver for his wife prior to his hospitalization. Despite being on edge, he was very determined to get better and return home. 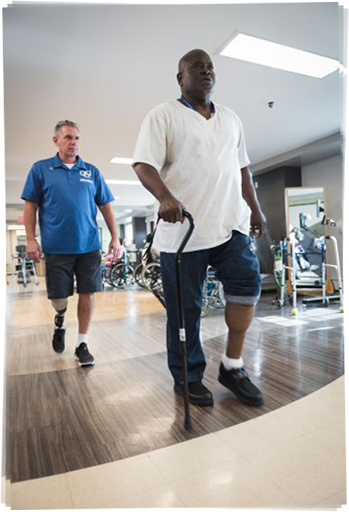 Due to Mr. Frazier’s motivation and the help from his physical, occupational and speech therapists, within just a few weeks he had increased bed mobility and was starting to be able to stand for slightly longer periods of time. His speech therapist, Julie Levy, was working with him on an oral motor and hyolaryngeal elevation exercises, and he had progressed from NPO to puree and honey thick liquid within a very short time. Around a week later, Mr. Frazier’s mood had begun to change. Although he wasn’t thrilled, he had started to have more hope and was getting less depressed due to his progress. He was unable to walk a long distance with his walker but was still very determined. With a little more time, Mr. Frazier was walking longer distances while at the same time was trialing one mechanical soft meal a day! At this point, Mr. Frazier’s mood had improved tremendously. Mr. Frazier would often say how appreciative he was of his therapists’ help and how they would go above and beyond to make him comfortable along with his aide, Stacy Anna, whom he loved very much. Only a few weeks later, Mr. Frazier was walking over 300 feet and was wearing a green band which meant he’d be able to eat small amounts of regular foods! On July 31st, 2018, when Mr. Frazier was discharged, he was performing ADL’s regularly with modified independence. Mr. Frazier had left The Encore to return back to Brookdale Assisted Living to be with his wife. We wish him and his wife only the best from The Encore. Mr. Gordon Dern was admitted to The Encore from Boca Regional Hospital where he had been in a state of complete living dependence and came to The Encore to learn how to live independently again. When Mr. Dern arrived, he was completely dependent and was in a lot of pain. On Mr. Dern’s first day, his therapists, Grace Montague and Edline Morin, treated him immediately for pain. Mr. Dern was unable to do anything on his own. He was on oxygen and required assistance with lifting his foot. He was able to stand but could not take any steps. He was only able to tolerate approximately 20 minutes of therapy at a time and he would often complain that he was in pain. At this point, Mr. Dern was concerned that he may never be able to walk again or go home. Mr. Dern, however, was committed to doing everything he could to get better. With time, Mr. Dern was able to tolerate extended therapy sessions. He would go to therapy every day and personally challenge himself alongside his therapists. Mr. Dern shared, “The therapists were excellent. I have no complaints about the treatment. They went beyond the call of duty.” Through his progression, his mood subsequently improved, becoming increasingly more hopeful in the rehabilitation process. A week later, Mr. Dern’s pain began to decrease, and he was able to tolerate standing while taking a few steps with a walker. His activity tolerance and endurance began to increase, allowing him to participate in self-care tasks, including self-dressing without pain. With a little more time, Mr. Dern started ambulating with contact guard assist with a walker and was walking approximately 50 feet. In the same week, Mr. Dern progressed to standby assist, ambulating approximately 75 feet and very shortly after he was under basic supervision with a walker. We wish the best to Mr. Dern as he is working towards a point with the least restrictive device. Dr. Sandra Porterfield was admitted to The Encore from Northwest Medical Center for sepsis, which required roughly three months of physical, occupational, and speech therapy. When Dr. Porterfield arrived, she was 100% dependent. She was fragile, as she couldn’t even lift her cell phone. Dr. Porterfield was unable to eat without a peg-tube and needed a Hoyer-lift to be transferred. She felt paralyzed from the waist down. She was suffering from clinically induced depression, which resulted in her often being upset when considering her current state of health. Dr. Porterfield was placed on isolation for her first week. She was very non-cooperative in result of her depression. Her physical therapist, Mical Orrell, and her occupational therapist, Eric Kalina, originally were only able to position her in bed and perform select in-bed exercises and active assistive techniques to begin. In a short amount of time, her therapist asked her sit on a chair after Dr. Porterfield finally agreed to transfer from bed. Eventually, she agreed to come to the gym for therapy. She would only stay for a short time and would go back to her room. With more time, Dr. Porterfield’s therapists had her standing in the standing frame! Dr. Porterfield shared with our Director of Concierge Services, Michael Rubin, “when noticing myself getting stronger I stopped resisting, I was less depressed and began to have hope. I realized my therapists were right.” A few days after speaking with Michael she took four steps in light-gate, which had officially begun the walking process. The next attempt she took ten steps, then the next time she had walked the full length of the bar in the light gate and back (20 feet)! She was finally strong enough to use a walker for approximately 20 feet of walking while being supported through contact guard assist. Dr. Porterfield left The Encore to her home and was very happy. Her goal was to be more independent with a cane alongside home health support. She has since reached out to Michael Rubin stating that she is walking regularly with a cane! We wish her only health and happiness going forward. Dr. Porterfield still comes to visit The Encore as her mother is a resident at The Encore as well.